A pirate's best friend, the Deluxe Pirate Cutlass is the accessory every aspiring sea thief needs to embark on their adventures. Whether you're pillaging, sailing the seven seas in search of treasure or attending a Halloween party, this pirate cutlass is perfect for you! 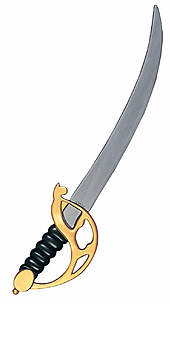 Why not pair this Cutlass with the Caribbean Pirate Costume, or any other Pirate costume on our website?